What evolutionary attraction would lead fungi to produce light? According to the Wet Tropics Management Authority, no one knows why they bioluminescence, but across an incredible evolutionary history, and in circumstances of such consistent windlessness, fungi appears to have adapted by mimicking the reproductive visual cue of the flightless female firefly. 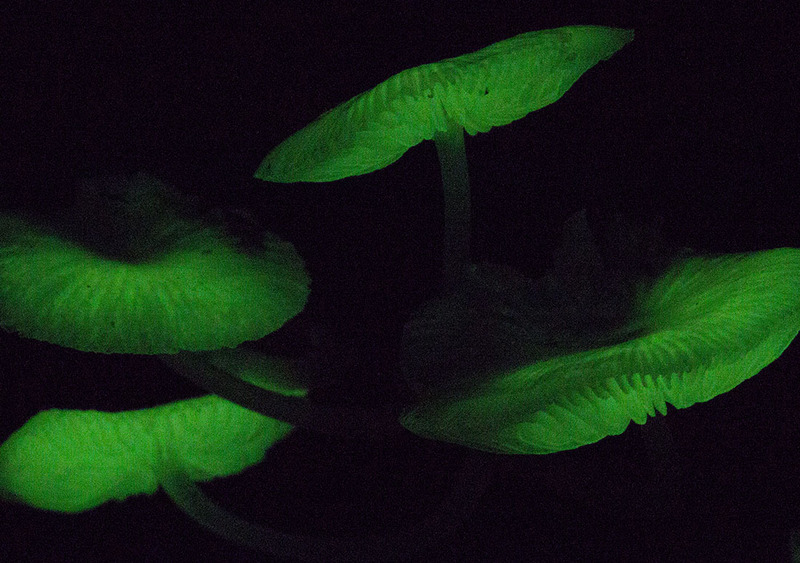 Emitting an identical light, from an identical chemical reaction, the glowing fungi lures the male firefly into making contact, to carry spores throughout the forest over the remainder of his nocturnal journey. In a similar vein, the flowers of the Bottlebrush Orchid (Dendrobium smilliae) are powerfully attractive to green tree ants (Oecophilla smaragdina). Taking into account factors including background colour, ambient light and colour range, the prominent dark-green glossy aspects of the bottlebrush orchid, seem to present an irresistible abdominal similarity to the reproductive enthusiasms of the Green Tree Ants. Reproduction is certainly high on the priority list of life, but survival is an even greater motivation, with the juvenile Amethystine Python (Morelia kinghornii) mimicking a venomous Brown Tree Snake (Boiga irregulars). A newly-hatched python has little recourse in the event of predation, but looking like a moderately-sized Night Tiger would surely stay the enthusiasms of many dangers. How the attribute is achieved is the puzzling conundrum, but for the marvellous requirements of necessity.